Soups are boring! Soups are bland! Or so I thought as a little girl. Except for Chinese soups. Those I adored. Be it the tangy hot & sour soup. Or the thick chicken sweet corn soup. Or the thin broth with pork dumplings swimming in it. I drank those to the last drop and licked my bowl clean, did not even let the last wispy bit of spring onion escape. Squeaky clean. But the other variety, tomato, carrot, chicken or lentil soups. Nah, those did not excite me. Maybe it was all those packets or tins. Maybe it was the tropical heat or spring like winter of Kolkata. Maybe because my mother rarely made any soup at home. So I stayed away from soups. Avoided them in restaurants and buffets. Did not miss them much. 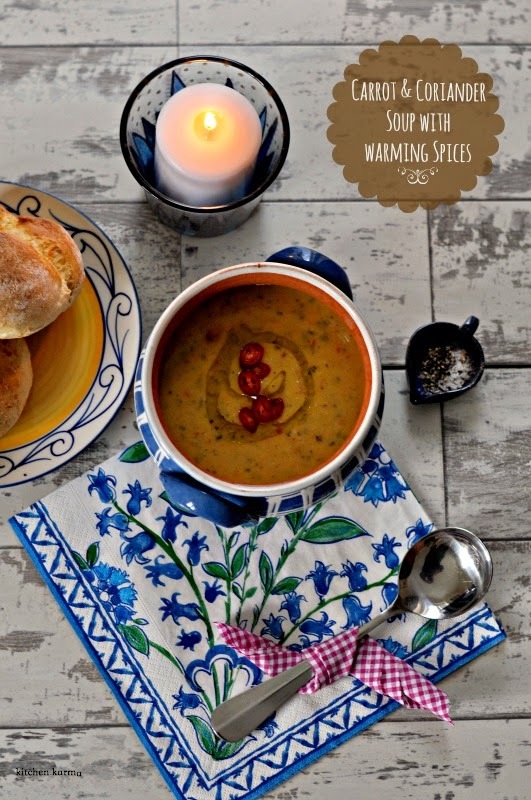 Then I shifted to the UK and to my surprise on chilly evenings I have the urge to hold a steaming bowl of soup. To drink it slowly, to feel the drink warming me up as it slowly makes its way inside. Now I get why soups are called nourishing and hearty. When I feel chilled to the bone, only my favourite pair of Himachali woollen socks and a spicy soup makes me feel restored. Of course I make Chinese style soups. My old love. But sometimes I have the urge to make other types too. 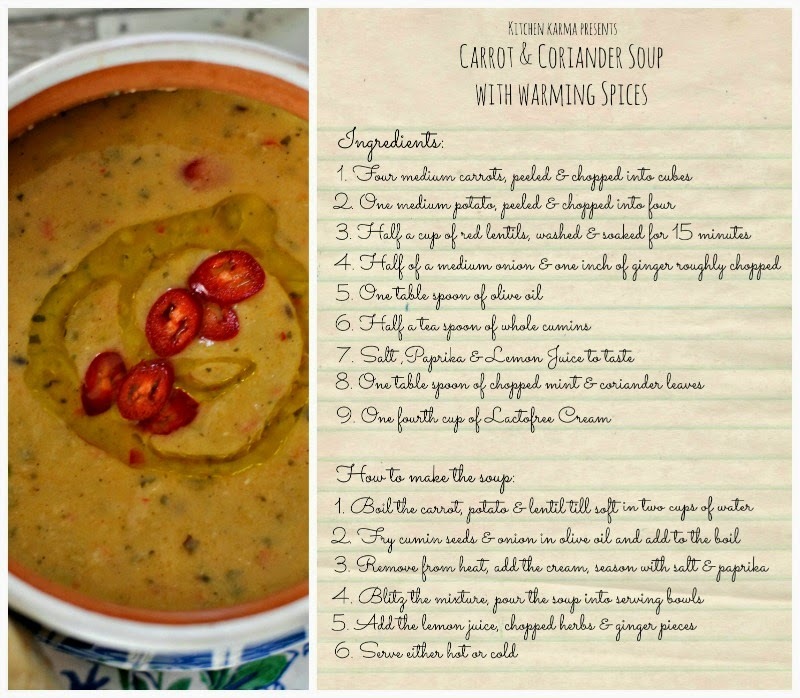 Thick soups with veggies thrown in. Flavoured with herbs and spices. Not boring, anything but boring. A burst of flavour, a bit of crunch, And a whole lot of warmth. So I potter in my kitchen, throw veggies and spices in the boiling pot. Or shred chicken finely before adding it back to it's broth. Sometimes it comes out nice and tasty. Sometimes, not so much. The I hit upon this recipe, which I really like and want to share with you. But before I do, I want to talk about a blogger event I attended a few weeks back. 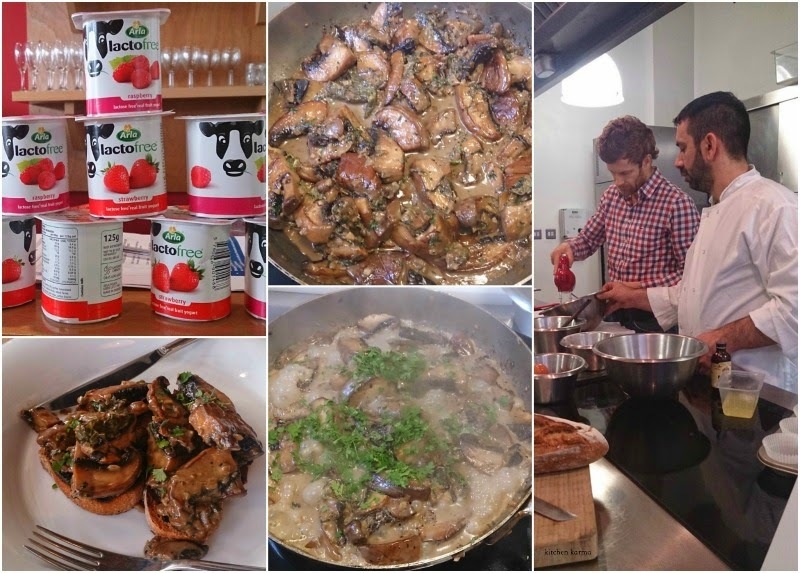 It was the Lactofree Breakfast Masterclass with Tom Aikens at L'atelier des Chefs at the St Paul's branch, London. Tom taught us to make raspberry muffins and then mushroom on toast. No, don't underestimate mushrooms on toast. Tom, with help of Lactofree Cream and a bunch of herbs like sorrel took the mushrooms to a whole new level. It was rich and decadent and the kind of breakfast that would completely floor you if your husband made it for your birthday. Yes it was that special. The class was fun and we made mushrooms for ourselves following Tom's recipe and at the end of it got to enjoy it while chatting with other bloggers. And we got to carry home a box of Tom's muffins. I came home all inspired to make Tom's mushrooms, made it and we devoured it before I could take a decent photograph. Since I had almost half the bottle of the cream left, used it to make a soup the next day. It turned out really nice, so much so that I kept a portion aside for a decent photo the next day. But once I heated the soup before lunch and brought out my camera I was feeling so hungry that I could hardly concentrate.The hot, tangy smell of the soup invited me and misted my camera lens. Damn I realised for the nth time that I am too much of a foodie to make a good food photographer. I just can't get my food get cold while trying to get that perfect photo. No way, I rather click a quick couple of snaps and get down to the business of eating. To get back to the soup, so don't go by these bad photographs. It tasted really great. I liked it hot, husband said that he liked it cold as well. That is how he had it in his office for lunch the next day. I forgot to add in my recipe card, while blitzing the soup if it gets too thick please add some hot water to thin it down. If you do so, it is best to give the soup another boil to incorporate the water properly. It's a pretty quick and easy recipe to make, if you are using the pressure cooker to boil the lentil and the vegetables. The rest of the ingredients are pantry/fridge staples. 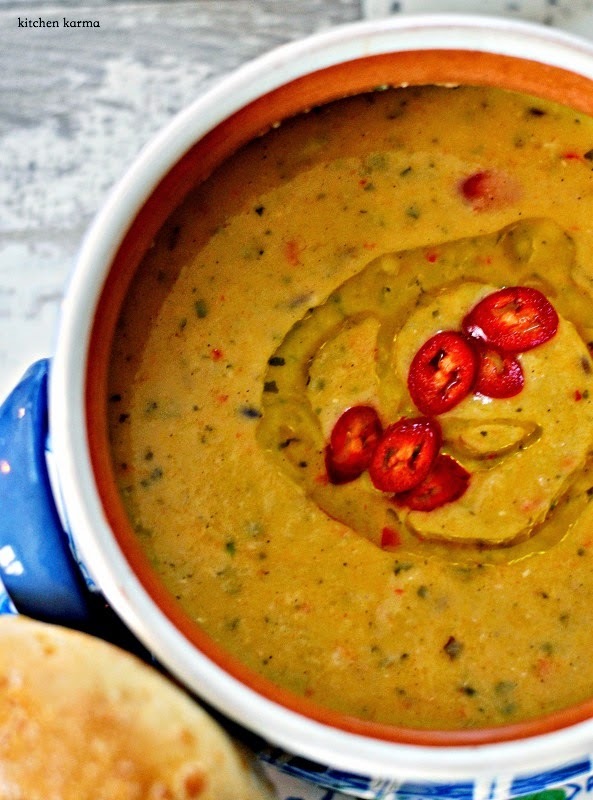 The cumin seeds add a whole lot of flavour and crunch to the soup. So does the paprika, mint and coriander leaves and lemon juice. 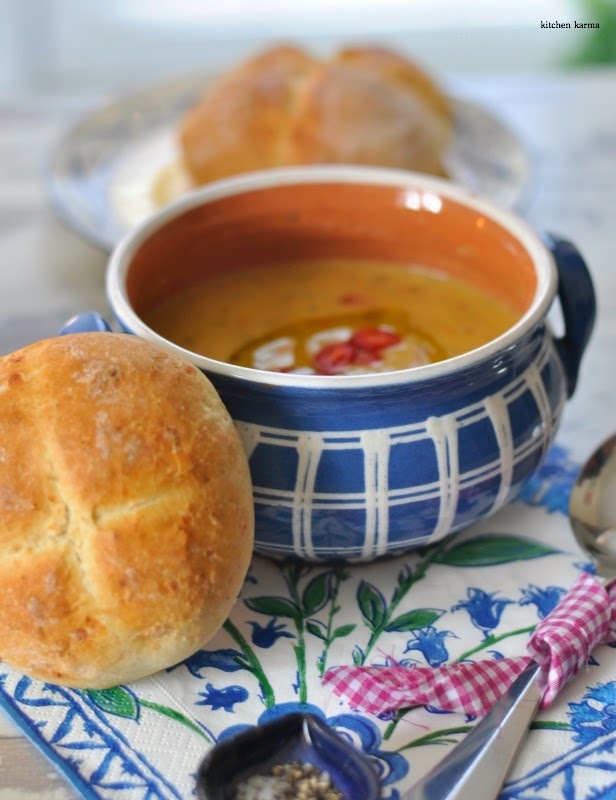 But it is the Lactofree cream which makes the soup so creamy and brings it all together. I would totally recommend adding it. My husband said that the cumin with the lentils reminded him of Indian daal a bit. I think that is what I wanted to achieve in this soup, the spicy with the hearty. P.S. In case you are wondering why I am making soup in June. It is because after one week of intense heat we are back to the cold and grey and the chill. So much so that I was contemplating taking out my woollen socks. But since it's June and the middle of spring I am resisting and just drinking soups to keep me warm. P.P.S A little note on the cream, as is apparent from the name of the company the product is lacto free and is specially designed for those suffering from lactose intolerance. I have used this range before and reviewed the products. The cream is hardly different from the other creams in the market. Frankly if I had not known about it, I wouldn't have known the difference. 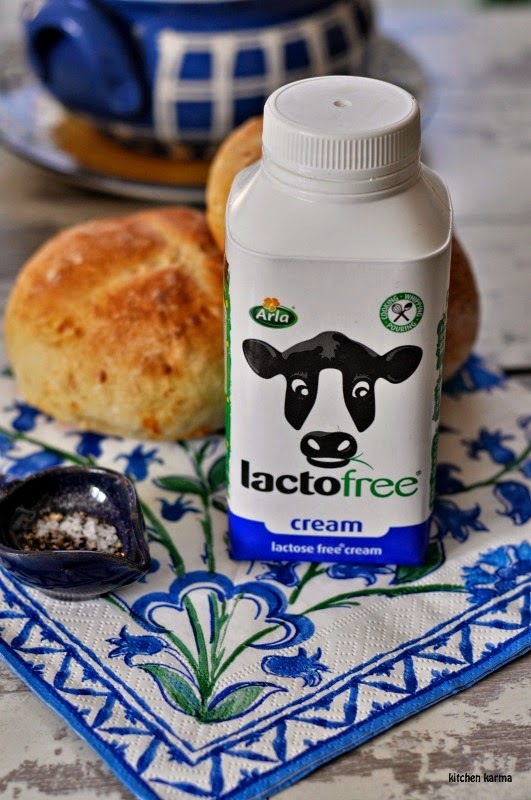 In fact now I prefer using the Lactofree Cream when I am cooking for a dinner party just to be on the safe side. Thanks Havas & Lactofree for the event invite and the Lactofree products.